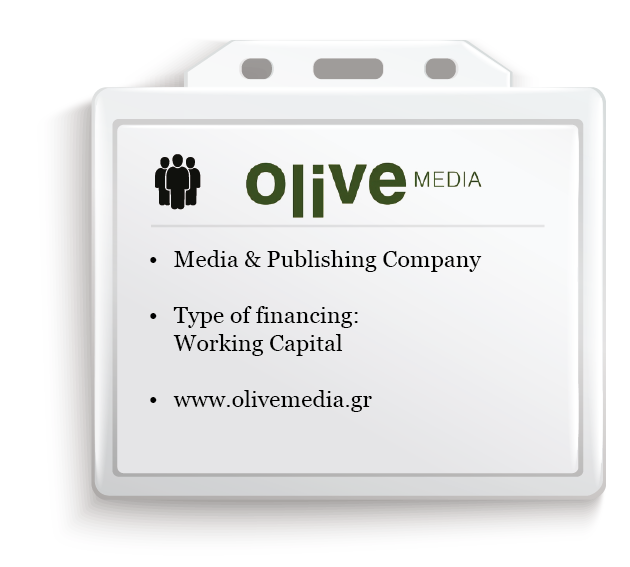 Olive Media is an integrated communications solutions provider, whose main activity is the management of global magazine titles and websites of Times Inc brands (Instyle, Fortune, and People) in Greece. In addition, Olive Media generates content for the media it manages, organizes special events of the above-mentioned brands and offers creative services to selected customers. The company was established in 2013 and despite the difficult market circumstances, was immediately recognized by the public and advertisers alike. A new company in the media industry (which has faced many demands), has tremendous difficulties with working capital. The media sector was affected by the crisis to a much greater extent than most other sectors, and also typically crystalizes its receivables with the kind of delay that does not help with cash flow. Banks were not willing to provide factoring – or any other model for the provision of working capital with the allocation of collateral (cheques and invoices) – as had been the case for media companies before the crisis and capital controls. The banks were no longer active in these products and couldn’t serve new companies like Olive Media that didn’t have existing bank lines. The company therefore needed a solution for its regular day to day operations. Not only was CNL Capital the sole provider of the service needed, but the company also stood out for the speed and flexibility of its executives. CNL Capital quickly brought itself up to speed with the specific characteristics of the media industry, and was efficient in its dealings with Olive Media’s management. Εventually, the process was completed quickly, seamlessly and without “noise” and burden, neither for management nor for those customers assigned for collateral. The company proceeded to a second financing, as communication with CNL Capital was results-oriented and quick, and the cooperation effective, hassle-free, and focused on finding immediate solutions. Due to the specific characteristics of our industry’s financing model and the permanent crisis that has affected it, the existence of CNL CAPITAL’s product offering is indispensable. For us, this financing creates a lifeline for the company to continue its smooth operations.